Lasagna is a popular dish, and for good reason. It’s cheesy, savory, meaty — all great things. But it’s not a slimming meal. 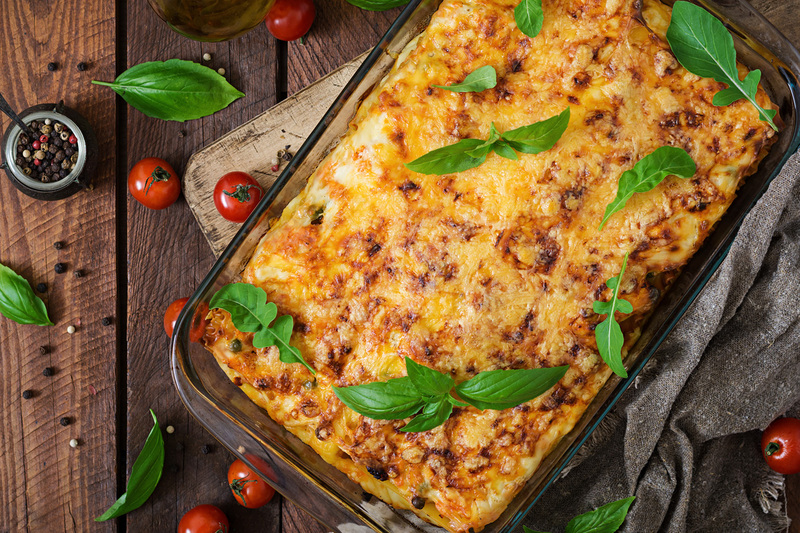 How can you make a healthier lasagna? Want to enjoy lasagna but worried about the calories? We’ve got you covered. For anyone that comes from an Italian family, you’ll have cherished memories of a huge tray of lasagna being shared over a family meal. It’s such a popular dish that it’s become a staple of American cuisine. Lasagna is perfect for a family dinner. One tray can serve an entire family, with leftovers to spare — unless you had an Italian nonna (grandmother) and one plate was never enough! But when you get down to it, the lasagna we enjoy is, well, pretty fattening. Those extra plates of cheese, noodles, meat, and red sauce are adding extra pounds. One serving of lasagna at one popular chain comes out to around 930 calories and over 50 grams of fat. Not exactly diet food. But there are a lot of ways you can tweak the dish to be healthier. Using vegetables will lessen the calories and fat of your lasagna, while boosting the fiber, natural sugars, and nutrients. We highly suggest trying the vegetarian option or at least a combination of lean beef and these veggies. Using vegetables will lessen the calories and fat of your lasagna, while boosting the fiber, natural sugars, and nutrients. Specifically, mushrooms, one of our favorite superfoods, can replace much of the texture, flavor, and substance that beef brings to the table. Sliced carrots and diced onions will impart a depth of flavor that will more than replace the missing beef. The other significant fatty factor is the filling that either takes the form of a béchamel or cheese mixture that makes up one of the layers of the lasagna. Many common recipes will call for a cheese-egg mixture, but we can improve this a little bit. Ricotta is essential to this mixture, so you don’t want to cut it out. Instead, try a light or low-fat version of ricotta, which has roughly one third the calories and under half the fat of whole milk ricotta. You can cut the calories further by swapping in additional types of cheese or dairy products. One common inclusion is fat-free cottage cheese, which is even fewer calories than the light ricotta. Cottage cheese is not for everyone, though, and we understand this. If you’re hoping to minimize the calories and fat, without compromising on flavor, we can turn to Greek yogurt. Low-fat Greek yogurt is about as light as cottage cheese, without the textural issues that many find off-putting. Nutritional yeast can be strong, so err on the side of caution. Add some, like a tablespoon, and try it. If it’s not cheesy enough for you, add a little more until it’s at the flavor you want. Concerned that Greek yogurt isn’t cheesy enough for you? Mix in some nutritional yeast, a common additive that vegans use to mimic the flavor of cheese. You can use this Greek yogurt-nutritional yeast mixture to yield a healthier cheese sauce. Nutritional yeast can be strong, so err on the side of caution. Add some, like a tablespoon, and try it. If it’s not cheesy enough for you, add a little more until it’s at the flavor you want. Remember, ricotta isn’t the strongest cheese, either, so it doesn’t need to taste like queso dip. Many people will make their lasagna with noodles, sauce, and meat alone, but they’re missing a real opportunity. Besides the mushrooms and carrots we suggested, you can also add spinach, kale, or a number of healthy spices and herbs. Onions and garlic, two important flavors in Italian cooking, are both loaded with nutrients that reduce blood pressure, lower your chances for heart disease and dementia, and can even help you live longer! Onions and garlic, two important flavors in Italian cooking, are both loaded with nutrients that reduce blood pressure, lower your chances for heart disease and dementia, and can even help you live longer! Many popular spices are also healthy to include in your dish. Much like garlic and onions, basil is packed with antioxidants and vitamin K. The same can be said for oregano, but this spice can also reduce inflammation and may help you fight illness. Many herbs are also rich in antioxidants like polyphenols, making it a smart, flavorful addition to your dinner. Heat the extra virgin olive oil in a large skillet. Sauté the onions until the onions are translucent. Add the mushrooms, the carrots, spinach, and kale until the carrots are soft. Combine the Greek yogurt and nutritional yeast. Taste the combination. If it doesn’t taste cheesy enough, add more yeast. In a large bowl, mix the ricotta, yogurt-yeast mix, and eggs. Mix in the basil, oregano, 1 cup of parmesan, and mozzarella. Stir the mushrooms, kale, spinach, carrots, and onions into the filling. Spread about ½ cup of pasta sauce on the bottom of a 13x9x2 baking dish. Make a layer of lasagna noodles. Cover lightly with the filling. Spoon a light layer of pasta sauce over the filling. Continue steps 10 through 12 until you reach the top of the dish. The top should be a layer of noodles, a layer of pasta sauce, and a layer of ½ cup of parmesan cheese lightly covering the sauce. Cover the baking dish and bake in the oven for 40 minutes. Uncover and bake for 15 additional minutes.